Wood chip paths are found in urban allotments and parks as well as stately homes and country cottages. They are casual trails that are durable and dry and direct users through the landscape in a rather informal way ie people can join or leave them as and when they please. 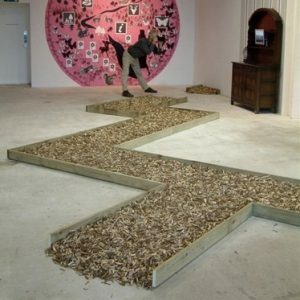 Similarly, in the exhibition Town and Country at PSL [Project Space Leeds], the path is used as a device by which visitors may journey around the exhibition. However, the path is also a folly since it peters out unexpectedly or leads the viewer into walls and pillars. The title of the work refers to the deceit of being led ‘Up The Garden Path’.